This deliciously spicy scent is the ultimate cosy candle. Blended with base notes of nutmeg and spiced pumpkin, it’s sure to have your home feeling truly, welcoming and homely. Perfect for those warm winter nights snuggled up with a hot chocolate and Christmas treats. Make your home feel heavenly this festive season with Katie Loxton's latest collection of festive fragranced candles for cosy nights in! Blended with the highest quality soy wax and essential oils, this particular candle has a nutmeg and spiced pumpkin aroma (just reading it has us drooling already! 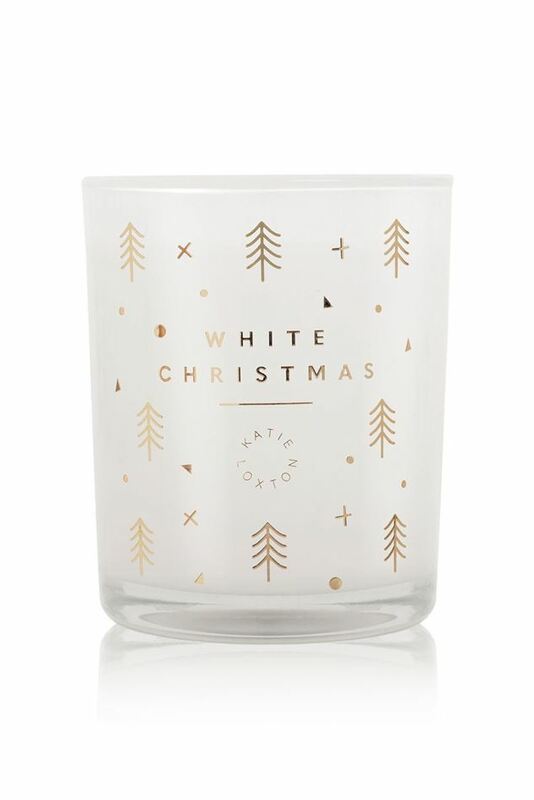 ); the wax is set in a glass jar decorated with golden stars and the sentiment 'white christmas' in gold capital lettering printed on the front; it's then perfectly packaged in a beautiful triangular shaped box, reminiscent of a Christmas tree, with the same sentiment title and decoration.